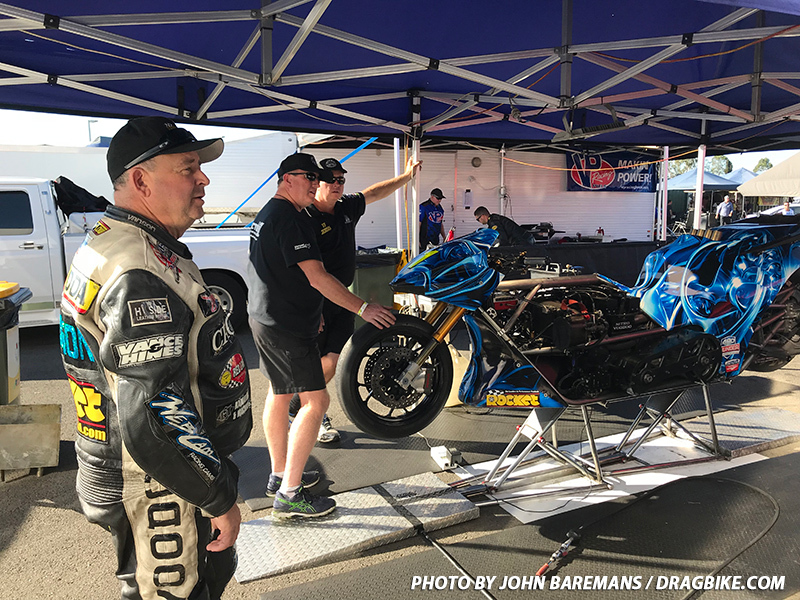 Australia’s National Top Fuel Motorcycle Champion Chris Matheson has taken yet another step in the right direction to improve on his performance following the Gulf Western Oil Nitro Thunder event at Sydney Dragway. The Brisbane-based racer is the quickest man on two-wheels in the Southern Hemisphere with his current record of 6.04 seconds at over 240 mph (380kph) standing for several years. 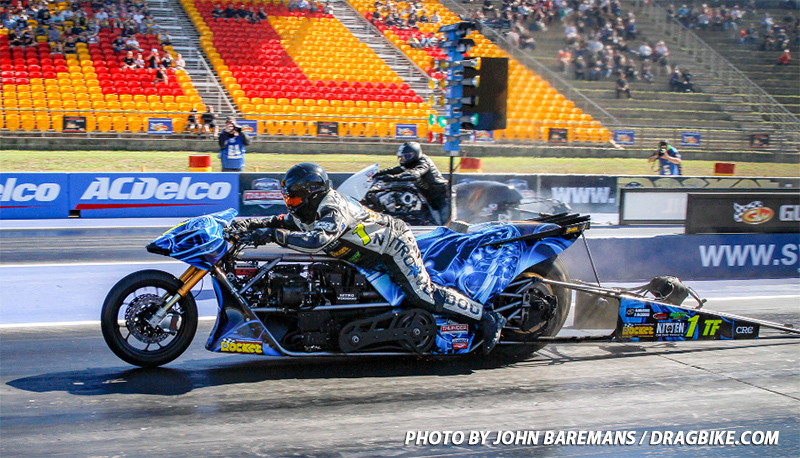 Matheson knew the Sydney event would provide the ideal conditions to clock some quick times in the lead up to the final event of the season – the 51st Winternationals at Willowbank Raceway in June. “In qualifying, we wanted to continue our focus on recording fast times in the first half of the track,” said Matheson. “We know that if we can get the bike moving quicker, the results we are chasing will come. “The first test run was to find the limit on the track, then move forward from there. We found it when the tyre went up in smoke at the hit of the throttle. “On the second run, our setup was more conservative to ensure we got down the track. It worked and we clocked 1.041 seconds in the first 60 feet, 2.62 to the 330 mark, and then shut the bike off in 3.8 seconds before half-track. To say we were excited was an understatement, as we hadn’t seen those numbers in over 8 years! “The increments were very encouraging and we were pumped for the second day,” said Matheson. Unfortunately, two teams had sustained damage and were not able to front for eliminations, thus reducing the field to just two bikes and running exhibition passes. Regardless the “Nitro Voodoo” team was happy with the results. “We know we are moving forward and getting closer to seeing the fruits of our labour coming together,” said Matheson. “Yes it was disappointing to have not wrapped up our fifth straight Australian Top Bike Championships, however, we will now get to do it in front of my home crowd and sponsors in Brisbane next month for the Winternationals. Chris Matheson Racing is proudly supported by the following sponsors – Kitten Ultra, Rocket Industries, CRC, Web Cam Racing Cams, Larry McBride, Worldwide Bearings, Boninfante Friction Inc, Performance Decals & Signage, Bill Furr Orangeburg Cycle Racing, Hi-Side Leather Repair, Performance Wholesale, GT Radiators & Machining, GT Radiators, Boninfante, Great Southern Diesel Services, Aeroflow Performance and Ballistic Performance Parts.